The most complicated and important part of your overhead door system is the opener. Because it consists of both electric and mechanical parts, this unit is susceptible to a wide variety of malfunctions, like broken motor gears, problems with the drive-system, as well as electrical issues such as frayed wiring and faulty circuit boards, to name a few. Our technicians know how to fix any problem your opener might have, and can also securely install new units from high end brands such as Chamberlain, LiftMaster, Genie and more. A malfunctioning opener is difficult to deal with, so it’s always best to prevent problems arising in the first place with regular maintenance. Our technicians will check the entire system from top to bottom, looking for signs of damage, wear and corrosion. We carry all the necessary replacement parts with them in order to be able to solve any problem on the spot. We will also lubricate the drive-system and adjust it as needed, as well as test the safety sensors' alignemnt and make sure they are capable of properly detect obstacles. Which Opener Do I Need? There’s a wide variety of opener units on the market these days, and although they all have their distinct advantages, the biggest difference between them is the type of drive system they use. Chain drive units are the most common type, due to the fact that they are affordable and durable. However, they make a lot of noise. Belt drive openers are quieter, yet also more expensive. Screw drive models are noisy, but they have the advantage of requiring very little maintenance, as well as being able to operate faster. Our experts can consult you on the different types of opener brands and models that are available today, and help you find a unit that will be a perfect fit for your door. We work with industry leaders such as Chamberlain and Amarr, and can help you take some additional features into consideration, such as WiFi compatibility and a backup battery system. Once we've helped you choose a new opener, we will install the new unit for you and make sure that it's able to open and close your garage door without a hitch and that its remote control is programed correctly. Whether you need to have a new opener installed, or your existing one to be repaired, our team is ready and waiting to help. 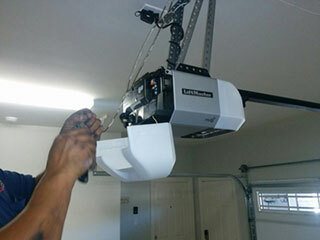 Contact Garage Door Repair Atlanta today to find out what we can do for you. Our professional team offers you the finest quality garage door service, repairs, and maintenance in town. We're rated number one in quality, customer service, and affordable prices. With our exceptionally wide selection of new doors, you're sure to find the color and style that will perfectly enhance your home. Contact us today for service and quality you can trust. Thank you for choosing our company! Feel free to browse our website for more information in the meantime. Our team at Garage Door Repair Atlanta is at your service any time!